Whether you’re a globetrotter struggling to decide where to go next, or a first time traveller picking a dream destination, there’s no shortage of beautiful places to visit in this world. From natural wonders to bustling cities and other spectacular sights, here is our pick of the most beautiful views to inspire everyone’s wanderlust. At over 9,200,000 square kilometres, the Sahara Desert is larger than most countries. Don’t let that overwhelm you, as it’s still accessible enough to take in the vast sand dunes, camel trekking, and clearest skies for stargazing. The most popular backpacker route to the Sahara is via Morocco. Visit during spring and autumn for better weather. The word Chefchaouen translates to “the blue pearl” this city is unlike any other. Nestled in the Rif mountains and painted various shades of blue, this city is an instagrammer’s paradise. Some people believe that when the Jews were escaping Europe they painted it to represent the sky and sea; others say it’s because the colour repels mosquitoes! Regardless of the reason, there’s plenty to see and do and amazing places to eat. Whether you’re planning a long trip or just have a layover, when visiting Egypt you can’t miss the iconic Pyramids of Giza. Surrounded by many mysteries, they’re something you need to see to believe. While you can go at any time, the weather is nicest from October to April. The site itself is open every day and you can wander around and even go inside the pyramids. Found on the Zambezi river on the border of Zambia and Zimbabwe is Victoria Falls – the largest waterfall in the world! There are many places to see the falls from, but the best vantage point is Knife Edge. During the dry season (October through early November) it’s even possible to walk through some parts of the waterfall. Hong Kong’s incredibly tall buildings make for a miraculous cityscape. View the wave of neon lights in a kaleidoscope of colours and escape the bustle of people while taking it all in. There are plenty of places to get a glimpse of the skyline: like from Victoria Peak, the highest point on Hong Kong Island, or Sky 100, the city’s highest observation deck. An easy day trip from bustling Seoul, Nami Island is a nature lover’s dream. Once at Gapyeong Wharf, you can either take the ferry to the island, or zip-line across. Zip-lining in gives you the best views of the island – perfect for anyone looking to be immersed in nature. Autumn is a great time to visit as you’ll see the changing colours of the trees, or March-April to see the cherry blossoms. During spring the country stuns visitors from around the world with shades of pink. Once the blooms arrive, do as the locals do and indulge in ‘hanami’ by picnicking under these beautiful trees and appreciating their flowers. They typically first appear in Okinawa in January and in Kyoto and Tokyo by late March and early April so plan your trip accordingly if you want to join in on the festivities. The symbol of Cambodia and one of the largest religious sites in the world, Angkor Wat is another World Wonder that’ll leave you in awe. Bringing in more than just history buffs and Tomb Raider fans, Angkor Wat was once a metropolis and as the largest religious monument in the world, a few days are needed to explore it all. For those short on time, the “Grand Circle” of Angkor Wat, Angkor Thom, and Ta Prohm can be done in a day. The best view on the site is catching the sunrise from Angkor Hill. This Indian festival is a spectacular sight that marks the beginning of spring. Celebrated all over India, it’s a celebration of colour that creates clouds of vibrant powders and paints coming from every street covering the people from head to toe. Recognised around the world, this festival of colour marks the start of spring. You’ll feel like you’re on the edge of the world at the Cliffs of Moher. Found on the west coast of Ireland, feel the wind in your hair and stand on the edge over 200 metres above the Atlantic Ocean. These cliffs were carved in the last ice age and inspired Irish legends including one about a magical underwater city. Visit from April through to the end of September for the best weather and optimal views. Just a short drive from Lisbon, Sintra is like a land from fairytales. Time seems to have stood still in this forest surrounded medieval town. With colourful and romantic architecture, Sintra is home to castles, mansions and decorative gardens. The must-see places include the Disney-like Quinta da Regaleira and colourful Pena Palace. The Cinque Terre consists of five vibrant fishing villages along the Italian Riviera in the northwest of Italy. While not as remote as they once were, they’re still quite difficult to access. By car you’ll face some narrow and curvy roads, making train the best way to arrive. Once there, you’ll be taken in by the quaint charm and clusters of colourful homes tucked away in the cliffs. There’s no need to choose between these two beautiful Greek islands. The islands themselves are only three hours apart and an easy flight or ferry back to the mainland. For those more beach and party orientated, head to Mykonos. For those looking for a more romantic feel, check out Santorini. Regardless of what you choose, the beautiful ocean views and white and blue cities are breathtaking. You won’t get better views of Dubai than from the Burj Kahlifa Tower – the world’s tallest building (829.8 metres)! Within the building is one of the world’s fastest elevators taking you to the observation deck at record speeds. Buy tickets online to avoid the lines, but there’s a reason it’s so popular. You’ll enter the building through the Dubai Mall (one of the largest shopping centres in the world), before heading up and getting a 360 view of the modern city as well as the Persian Gulf and Dubai Creek through the old city. Cappadocia looks like a place from a sci-fi movie, with interesting geological features known as fairy chimneys. These unique formations have become dwellings, cities, and castles in past cultures. For your best experience, stay in a cave hotel and take a hot air balloon trip in the early fall when the weather is nicest. If you’re not on a balloon yourself, get a spectacular view of balloon spotted skies from a rooftop terrace. If you plan on travelling through Canada, head up north during the darkest (and coldest!) time of year, December through March. You’ll be able to see the Northern Lights in parts of Ontario, Manitoba, Alberta, and B.C. provinces, and the Northwest and Yukon territories. The Wood Buffalo National Park in northern Alberta is home to the world’s largest dark sky preserve, making it the clearest place to view this magical sight. With snow covered peaks and alpine lakes, the rockies make North American’s most striking landscape. Spread across the western part of the continent, the Rockies are a prime spot for beautiful views, skiing and hiking. The best views in the Canadian Rockies are found in Banff and Jasper. Come in September and October when it’s less busy but not too cold. The US Rockies are best viewed in Colorado at the Rocky Mountain National Park, or Montana in Glacier National Park. Guanajato is surrounded by mountains and has an impressive mix of natural beauty, Baroque architecture and a distinct lack of tourists. Head up to the statue of Pipila to get the best view over the city. Bring hiking shoes for the trek or relax on the tram. Plunging over a mile down and carved by the Colorado River, the Grand Canyon is a vast orange-pink gorge in a National Park over 1.2 million acres in size. The best (and priciest) way to see the Grand Canyon is from the birds-eye view of a helicopter. On the ground, head to Hopi Point along Hermit Road. Aim to be there for sunrise or sunset for the best pics. One of Australia’s most iconic view is underwater. Head to Queensland to see the colourful marine life while snorkelling, scuba diving or through a glass bottomed boat. This wonder of the natural world is the only living thing seen from space, it’s bigger than the Great Wall of China. No matter which part of it you see, you’ll be in awe of its natural beauty. Go from June through to October for best weather and least rainfall. After heading up a steep 1700+ steps, you’ll get a panoramic view of the neighbouring mountain through the elaborate temple gates. This remote area is known as Bali’s “gateway to heaven” and is one of the most sacred places on the island. It’s impossible to narrow down a place with the best view in New Zealand, as this entire country is breathtakingly beautiful. Pick a mountain, hike it and you’ll be rewarded. Need a starting point? Go to Mitre Peak in Milford Sound on the South Island, or Cape Reinga, Northland – the country’s northernmost point. After you’ve finished taking your llama selfies, take a minute to enjoy your surroundings. The quintessential view of the ruins in Machu Picchu, is found at the Sun Gate. Whether you did the three day hike to get there or took the train, you can’t miss this view of the ancient Incan city. The Andes mountains in southern Chile and Argentina have captivated travellers and photographers for years. The rugged alpine and glacial landscapes offer everything an adventure lover could want. Travel between September and May for the best weather and book your flight to Patagonia well in advance. You’ll be consistently surrounded by beautiful nature and towering mountains in this region, but the glaciers are the highlight. Get the best views of the glaciers by kayaking right up to them. While miles of emptiness and piles of salt doesn’t sound that exciting, it’s amazing how beautiful ‘nothing’ can be. If you’re looking to see it when it reflects the sky, come during the rainy season (December through April). Otherwise, for the fun perspective shots and to travel further, come during the dry season (May-November). From surreal deserts to hot springs and cactus hotels, there’s plenty to see and do in the ‘middle of nowhere’. Ashley is originally from Canada, but has been living abroad and travelling the globe since 2014. Through her blog, Wanderdolls, she helps others implement more travel in their lives by giving them the tools to start working remotely and abroad. Keep up to date with her adventures on Instagram and Facebook. 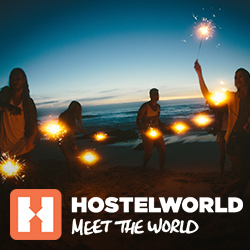 The post Life-changing views that will inspire your wanderlust appeared first on Hostelworld Blog.